This started life as a stock 1450cc FXDX Dyna Super Glide Sport. But it’s been bored out to 1700cc, making it the largest-capacity Harley-Davidson ever officially sold in the UK. It’s a stock 1450cc FXDX Dyna Super Glide Sport which has been bored out to 1700cc. Dubbed the FXDX XXL by the people who built it – Surrey Harley-Davidson – it puts out 112bhp and 112ftlb of torque – 65 per cent more than stock and that’s more torque than a Hayabusa lobs out. The motor features new cylinder heads, stronger pushrods, high-lift cams, a Mikuni carburettor and flat-top pistons which give higher compression. Apart from the carb, the parts are all from Screamin’ Eagle, Harley’s own performance division, and cost around £3,500. A standard FXDX costs £10,495. Surrey Harley’s boss Paul Stephenson said: " Our lead technician, Stuart Hunt, was asked to create something that would amaze people who look at the performance figures. He’s done that and we’ve had loads of interest as a result. " 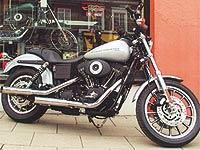 Britain’s previous largest official Harley was an FXDX with a 1550cc barrel kit. But the long-stroke kit used on the XXL puts a bigger sweep on the crankshaft, creating more room in the cylinder. All parts are guaranteed by the factory and the store will create as many of the bikes as it needs. Hunt said: " Its power is phenomenal for a Harley. It goes to show that cruisers don’t have to be slouches. We wanted to show the potential for a Harley and the options open to people. "